A few of my fellow bloggers have written about Bikkuriman Chocos before, but if you don't know, they're chocolate-filled wafers sold for a 100 yen at convenience and grocery stores. They're popular with young students as cheap snacks and because they often have sticker collaborations with anime and famous brands. I often buy a lot of Bikkuri Chocos when I see a collaboration that I like. The last one that I truly got excited about was the Star Wars collection about a year ago. But, they had released a Dragonball Z sticker set to tie in with the movie in theaters. I wasn't paying attention to the snack selection at the time, so I missed my chance to buy a lot of the set. Fortune smiled down on me not long ago when I was at Don Quijote. 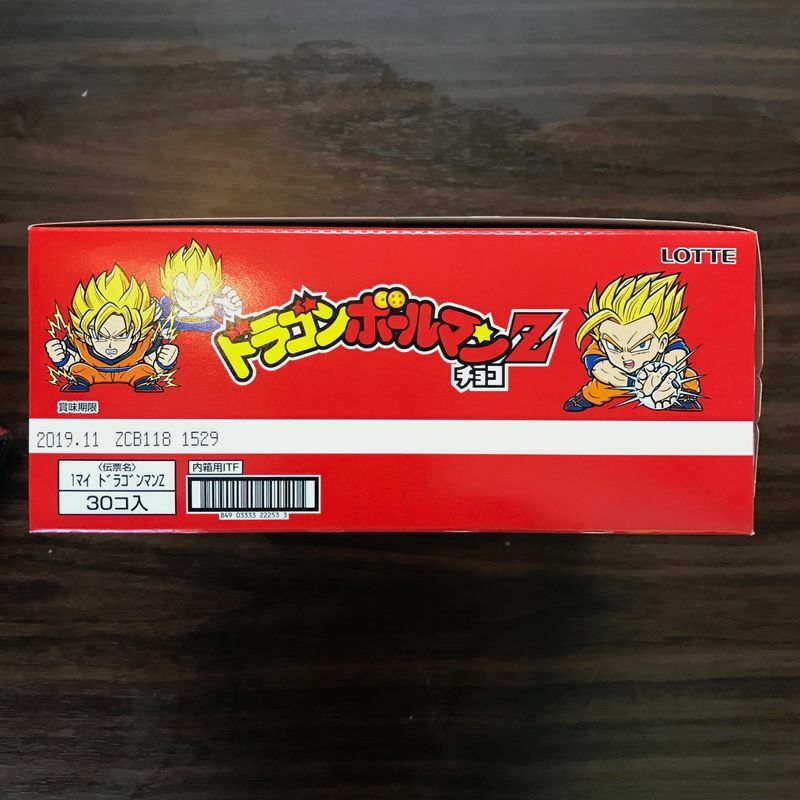 There, among the sale items, was a box of DBZ Bikkuri Chocos. I felt like it was a sign that I needed to buy them. One box contained 30 wafer packs. Because the DBZ movie was already long out of theaters at the time of purchase, the set was on sale. It was only 2000 yen for the box, down from the 3000 yen I would've paid at full retail price at a normal store. Opening it up was both beautiful and terrifying. The rows of wafer packets were just staring up at me, ready for me to open them up. I was determined to get through these all before the expiration date hit. In the box, there were two different package designs. They both contained the same set of stickers, but you have the opportunity to choose which set you think is luckier. I would normally opt to go with Freeza, but since I had the entire box at my disposal, I opened up one of each. The snacks themselves are pretty unassuming. They're a standard wafer with a thin spread of chocolate and wafer chunks sandwiched together. The taste definitely isn't bad, but it gets boring very fast. When I'm really vying for a collection, I'll usually buy a bunch and hand off the wafers to friends because I get so tired of them. Now, even my friends turn the wafers down... Maybe I'll try to repurpose them into a pie crust or something. Unfortunately, neither package gave me spectacular stickers. I got Son Gohan and Son Goten from the two packages. I was hoping for a cool Trunks or Shenron or something. But, lucky for me, I have 28 more chances at getting something good. Wish me luck!